Hinged front opening with fabric-covered background. 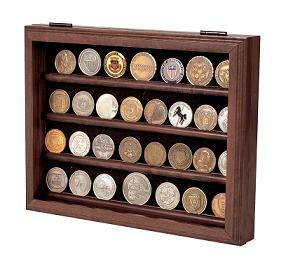 Holds 32 challenge coins. Available in solid walnut...15 inches x 11 1/2 x 2 1/4 inches. Ships to USA addresses ONLY. No PO Box shipments on this item. Coins are not included.